A rug can be the largest splash of color in the room or a simple delicate accent. It should accentuate the furniture and other décor you have, or plan to purchase. If you are decorating a room from scratch you have the opportunity to decorate from the floor up. Most designers feel it is much easier to choose fabrics to compliment a rug than the other way around. Therefore, rug shopping is a great place to start decorating. Regardless of whether you are buying new furniture or using what you have, knowing exactly where the furniture will be placed will assist you in finding a rug that accentuates the room. If you are planning to purchase new furniture, take measurements of each piece and plot each item on graph paper where you expect it to go. If you are using what you own, move the furniture into the positions you like best. Then using this room guide, determine which size rug is best based on the room and the furniture placement. The size of the rug along with the pattern and colors in the rug will give you a guide as to how much impact you can expect it to have in the room. If you want a dramatic impact you should use brighter colors and bold lines. If you would like your rug to be less of a focal point and simply add subdued warmth to the room, then choose a rug with more neutral colors or tones and softer lines. Regardless of whether you want a rug with more or less of an impact, the right size is critical because if you purchase a rug that is too small it will visually “shrink” the room. The colors in your rug should compliment the upholstery of your furniture. Therefore it is advisable to take a swatch or throw pillow with you when shopping for a rug. Once you have chosen a rug that compliments your furniture colors and upholstery, then choosing the window treatments and wall color will bring the whole space together. If you have a rug design that incorporates a center medallion, the medallion should be centered with the midpoint of the sofa or centered under a table. If a medallion is not centered, it throws your room off balance. 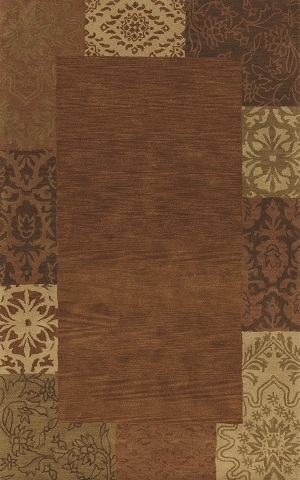 To avoid this, choose an all over pattern, a solid or tone on tone rug. If you are placing a rug in a small room, choose a small pattern to make the room appear bigger. A large pattern will make the room appear too crowded. If you have furniture with a floral pattern you can also choose a rug with a floral pattern. However, make sure the size of the pattern is not the same to avoid losing visual interest in your room. Call Mark Gonsenhauser’s Rug and Carpet Superstore today at 757-486-6600 to learn more about finding the right rug for your home.